Lote Tuqiri joins in to celebrate Kameli Raravou Soejima’ s (5) winning try against New Zealand yesterday. Photo: Bruce Southwick/ ZoomFiji. Fijian-born Kameli Raravou was still coming to term with the try he scored as they beat the New Zealand men’s rugby sevens team 14-12 at the Rio Olympic Games yesterday. “I’m still asking myself if I really scored that winning try against New Zealand,” Raravou who plays under the name Kameli Soejima told SUNsports. Emotions were running high in the Japanese camp after scoring their first ever win over the Kiwis at the Deodoro Stadium in Rio de Janeiro, Brazil. It was a memorable moment not only for the Japanese but also for the Nasekula native from Macuata. The village of Nasekula is also the home of former national rugby sevens legend Jope Tuikabe and national rugby fifteens openside flanker Emosi Tatawaqa. “This is the Olympic Games it’s different from the sevens’ series and scoring that winning try is a memorable moment for me. The boys really had the guts and we just gave it our all till the final minute. Even now I’m still asking myself if I really scored that winning try,” Raravou said. The 33-year-old said that after the game he had to pinch himself to see if it was not a dream. “This because beating New Zealand in the Olympics is a huge achievement for us. Even for me I don’t play professional rugby compared to my team mates but I’m proud to be playing for Japan and also representing Fiji in Japan. “I want to dedicate that winning try to all my people in Nasekula.” Raravou who has maternal links in Cicia, Lau went to Japan in 2009. 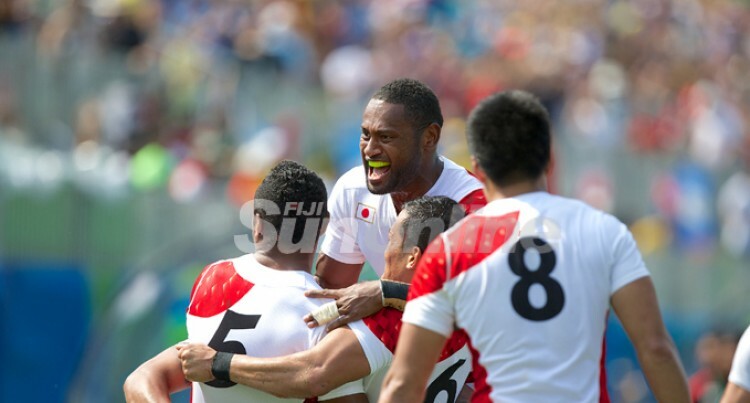 Playing alongside Kameli brings back memories of playing back at home, says Japan sevens forward Lote Tuqiri who is also a regular in the World Sevens Series. “Playing in the Olympics is a good experience for us and I’m glad that we have another Fijian player here, playing with him brings back memories of how we play rugby back home in Fiji. “I’m happy that we are playing together here when he holds the ball I know he would create something so I just need to follow him,” the former Marist Brothers High School student said. Meanwhile, Japan narrowly lost 19-21 to Great Britain in their second pool match.